This project will critically consider the illegal logging of rosewood in Madagascar. While the region is historically known for its biodiversity and the diversity of its landscape all evidence indicates that the environmental issues which have plagued the country are becoming more severe in recent decades as a result of the altering global climate. The effects of poverty and population booms have created a situation of desperation among the people, facilitated by political instability and an economy which is regularly rated as being among the world's worst. The poverty of the Malagasy is inciting further environmental degradation as the Malagasy turn to environmental exploitation for survival in areas already plagued by political instability and delicate ecosystems. The illegal logging of endangered hardwoods has been a problem in Madagascar for decades. The logging is a product of extreme poverty and governmental corruption. Rosewood is a hardwood which is both strong and heavy. It is used in the creation of high end products like guitars, marimbas, billiard cues, chess sets, furniture and, luxury flooring. In 2009 Gibson guitars was raided by agents of the Fish and Wildlife Service. Gibson came under scrutiny for rare wood purchases and were investigated for violating the Lacey Act, particularly in relation to illegal logging in Madagascar.The question seemed to be whether Gibson had been buying illegally harvested hardwoods from protected forests. Peter Lowry calls the Madagascar wood trade the "equivalent of Africa's blood diamonds." Gibson was raided again in August 24, 2011, but the investigations are on going. In March 2009, Andry Rajoelina successfully staged a military coup and took control of the government. The current decimation of rosewood trees in Madagascar is directly correlated to Rajoelina's regime and political instability which was the result of it.Due to the instability of Rajoelina's government, there was an increase in the illegal harvesting of hardwood trees even within the National Parks. The CIA fastback states that tourism was down 50% in 2009. This is a massive drop that the CIA ascribes to a lack of physical security for visitors. 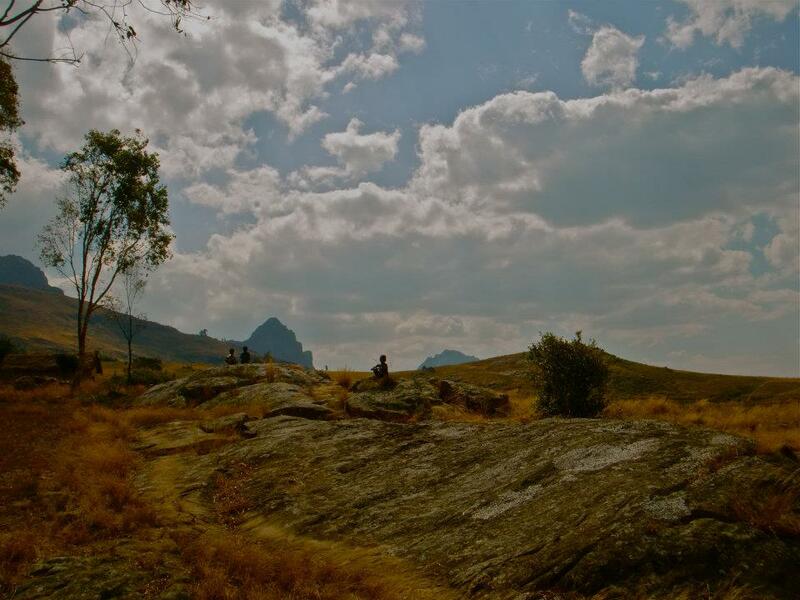 Although, tourism still exists in Madagascar, the current regime fails to protect the flora and fauna that international visitors and their international wallets come to see. The political instability on the island has done much to undo the work of environmentalists, who have worked to redefine the island as a hot spot for ecotourism. After the 2009 coup, tourism has drastically dropped off while rumors of roving bands of armed thugs in the National Parks have increased. 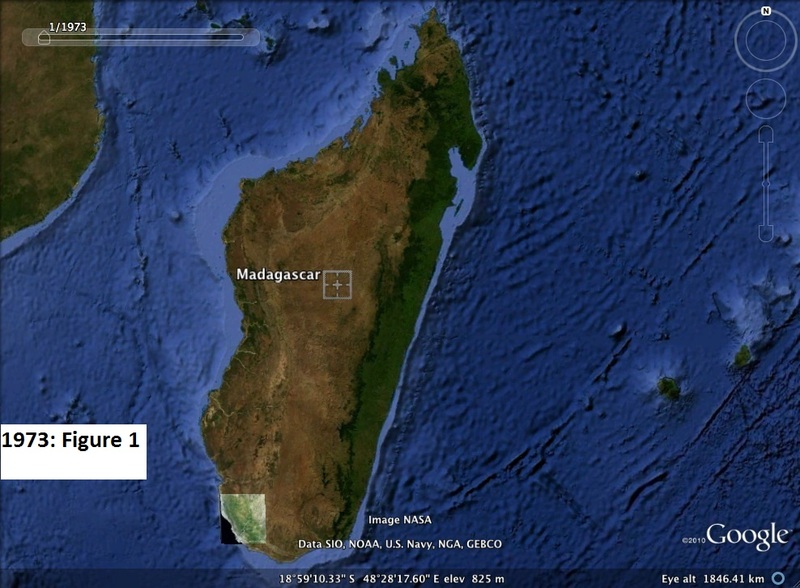 The story of Madagascar is one of short-term gain. Scott Paul, director of the forest campaign at Greenpeace US stated that in cases of illegal logging "we're dealing with a part of the trade that is well documented as some of the worst of the worst organized crime, money laundering, arms trade, drugs trade, slavery." The conflict is in the resource level and the questions most pertinent to Madagascar at this time are how will develop in the coming years. There is a certain amount of time in which the government can institute policies to reduce the probability of conflict; however, with the current regime this seems unlikely. The concern is for the severity of natural resource depletion and its resulting resource-related violence. Madagascar is one of the most biologically diverse countries in the world. Around five percent of the world's species live on the island. Due to population pressures and intense poverty, the natural resources of the country are exploited for short term profit. Since the French colonized Madagascar in 1896, the Malagasy forests have suffered the effects of massive deforestation. 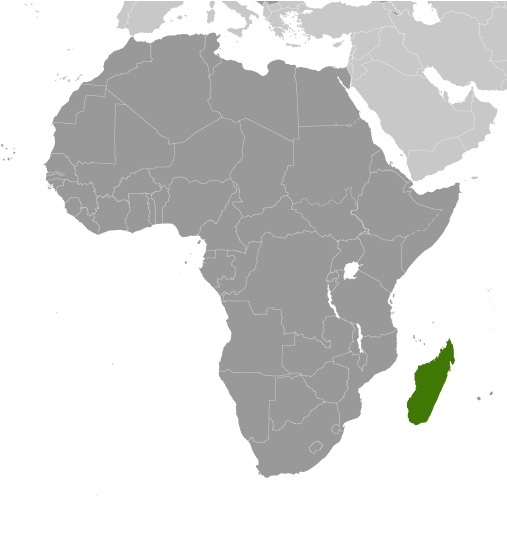 Roughly eighty percent of all plant and animal species found in Madagascar exist nowhere else. Over 10,000 plant species are native to Madagascar, ninety percent of which are found nowhere else in the world. Since the 1950s, roughly 90% of the island's forests and ecosystems have been affected in some way by farming, deforestation and, tavy (a native slash and burn technique). In 2009, a controversy surrounding the illegal harvesting of rosewood in Madagascar came to the world's attention. Criminal syndicates are reported to harvest the trees from within national parks for sale in mainland China, where the finished product is often shipped to the United States and parts of Europe. Although the practice of harvesting hardwoods from protected areas in Madagascar had been banned since 2000, the government occasionally allows the export of wood, claiming that the trees were felled due to cyclone damage. 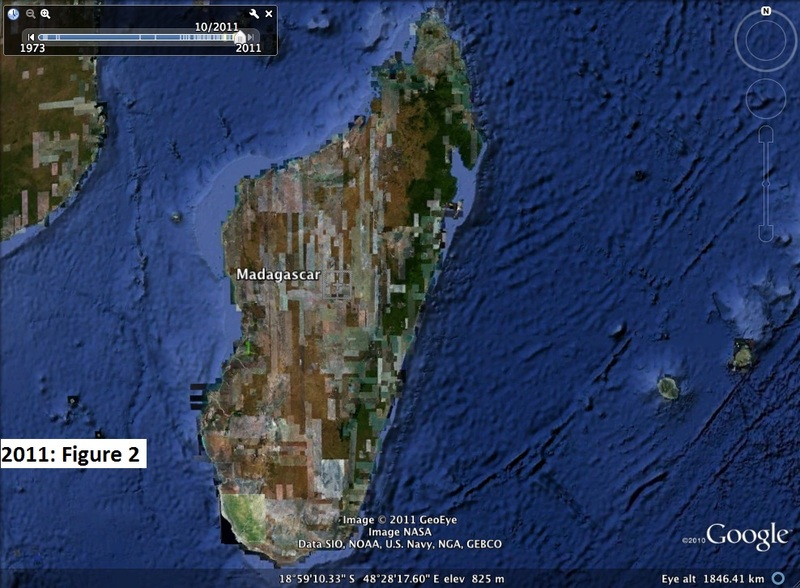 Madagascar is located in the Indian Ocean 250 miles off the eastern coast of Africa, just south of the equator. Due to its isolated location, the conflicts that occur on the island are civil, involving no other states. The people involved in the Malagasy rosewood debate vary from the Malagasy, to the consumers of the illegally forested hardwoods, to the environmentalists looking to stop the eradication of the forests and the endangerment of already vulnerable species. However, at the very base of this issue stand the Malagasy government who allow the illegal harvesting of hardwoods and those who purchase the rosewood illegally. The desperation of the The people involved in the Malagasy rosewood debate vary from the Malagasy themselves to the environmentalists looking to stop the eradication of the forests and the endangerment of already vulnerable species. However, at the very base of this issue stand the Malagasy government who allow the illegal harvesting of hardwoods and those who purchase the rosewood illegally. The desperation of the Malagasy people leads to the environmental degradation, while the government's blind eye allows for the wood to be sold overseas. The maps above show the changes in the Malagasy landscape caused by deforestation. The drastic changes from the 1973- 2011 aerial maps show not only the drastic drop in forested land but also indicate the massive changes that can be seen in the 2011 map (figure 2). Desertification is also well defined in the 2011 map by the brown and white areas. 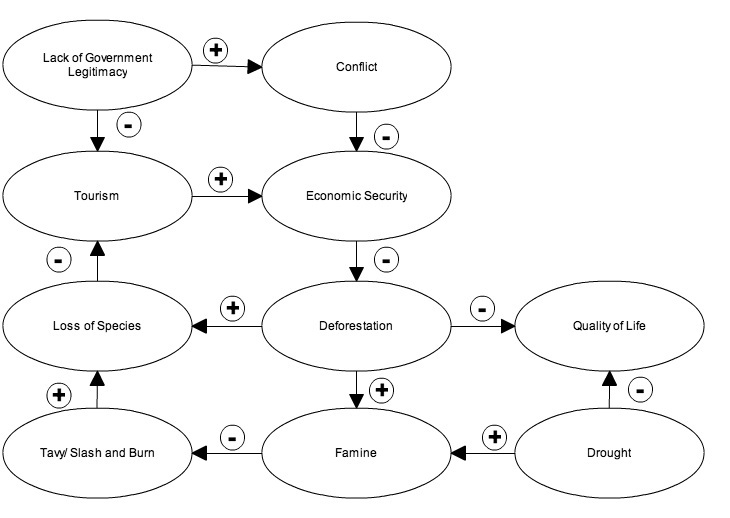 These maps show the level of deforestation that has occurred in the country since 1973 (figure 1). Since the rosewood trees are scattered throughout the forests, the devastation of illegal logging not only affects many species of endangered animals but also the flora. The effects of large scale illegal logging are more intensely illustrated in the designated park areas. 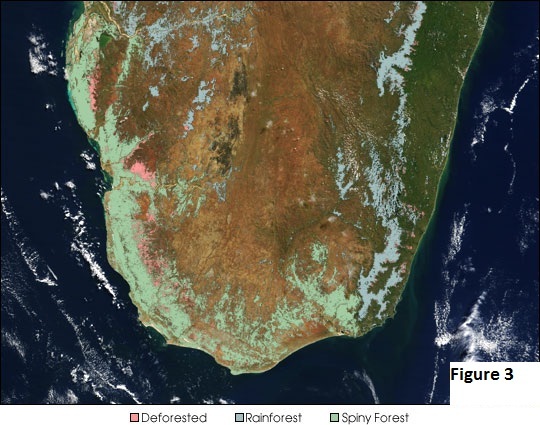 The map to the right (figure 3), courtesy of NASA, displays the current landscape on the southern tip of Madagascar.The image clearly shows the large degree of deforestation on the western seaboard as well as its proximity to the Spiny Forest in the area. The spiny forest is part of the Andohahela National Park, which is offerend limited protection by the malagasy government through the 'parcel 3 section'. The "spiny desert" of southern Madagascar is a globally distinctive ecoregion. The spiny forest has 95 percent of the plant species endemic to the island. However, this area is under pressure from the local malagassy who burn the area in order to create grazing areas for the native Zebu, harvest charcoal and firewood and, various logging practices. The future of Madagascar at this time is not bright. The deforestation of rosewoods will most likely continue illegally as long as the people of Madagascar are unable to find other means of supporting themselves. The previously mentioned deforestation, erosion, declining water quality and, desertification will not stop until either the government or international organizations intervene. The climate pattern in Madagascar will most likely change with a shortened rainy season and the possibility of increased cyclones. 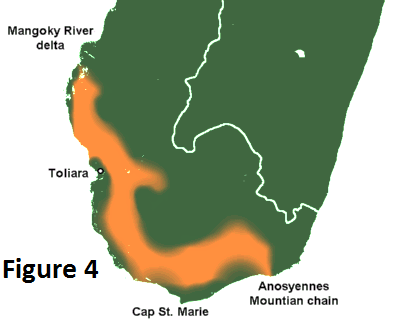 The habitat in Madagascar varies from a tropical coastline, to an arid southern region. The middle of the country is primarily temperate and has essentially two seasons. 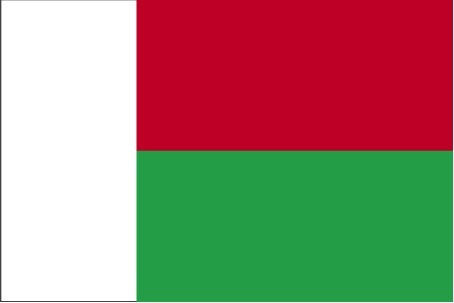 There are only two seasons in Madagascar. From November to April, the weather is hot and wet. From May to October, the weather is primarily cool and dry. The eastern coast of the island receives roughly 146 inches of annually while the western coast receives only 92. Madagascar is occasionally struck by cyclones and severe flooding. The criminal syndicates in Madagascar have often turned to violence in order to convince local communities to comply with their desires to harvest rosewood. Indeed park rangers and guides at Marojejy National Park have forced away from their posts at gunpoint and violent attacks on park staff have been documented in August 2009 at Mananara Biosphere Reserve and Masoala National Park. The drought and deforestation issues within Madagascar will continue as land use conflicts arise and deforestation continues. The climate will directly contribute to the potential for conflict through 2050. In terms of climate prognosis, experts predict a 10% increase in temperature and a 10% decrease in rainfall. This will result in the people of Madagascar struggling to feed their children. As usable land becomes less available, tensions among the people of Madagascar will increase. The poor economy of Madagascar and steady increase in population, combined with malnutrition will result in increased conflict and the continued pillaging of limited resources. It is estimated that loggers in Madagascar plunder up to $460,000 of precious woods from national parks daily. The harvesting of hardwoods has sharply escalated since 2009. The political instability in the area has resulted in timber traders taking advantage of the weak government and extracting large quantities of rosewood from protected areas in the region (Masoala and Marojejy National Parks as well as the Mananara Biosphere Reserve). As a result of the 2009 military coup, the U.S.Government suspended all non-humanitarian assistance as well as direct assistance to the Government of Madagascar. However, the United States continues to foreign assistance in health and food security through non-governmental organizations, community associations, and other private groups. The economic crisis in Madagascar is undeniable. Agriculture, including fishing and forestry, accounts for the employment 80% of the population. Unfortunately, the creation of national parks and the laws passed banning certain cultural farming practices (Tavy) have been economical devastating for the people of Madagascar. The drought and deforestation issues within Madagascar will continue as land use conflicts and deforestation continues. The climate will directly contribute to the potential for conflict through 2050. In terms of climate prognosis, experts predict a 10% increase in temperature and a 10% decrease in rainfall. This will result in the people of Madagascar struggling to feed their children. As usable land becomes less available, tensions among the people of Madagascar will increase. Although, there do still exist tourists in Madagascar the government fails to protect the flora and fauna they come to see. The desperate economic situation in Madagascar results in the people exhibiting little to regard for the devastating long term effects of their environmental practices. There does not exist consideration for preservation, conservation or, development. There is a certain amount of time in which the government can institute policies to reduce the probability of conflict; however, with the current regime this seems unlikely. The most pertinent concern is on the severity of natural resource depletion and its resulting resource-related civil violence. This violence is directly tied to the lack of political legitimacy held by the government.